Talk about Burmese food and most of us think about the ubiquitous ‘Khao Suey’. I have often wondered about the authenticity of this dish since recipes in different restaurants and homes vary from Thai-style to using core ingredients such as poppy seeds or gram flour. 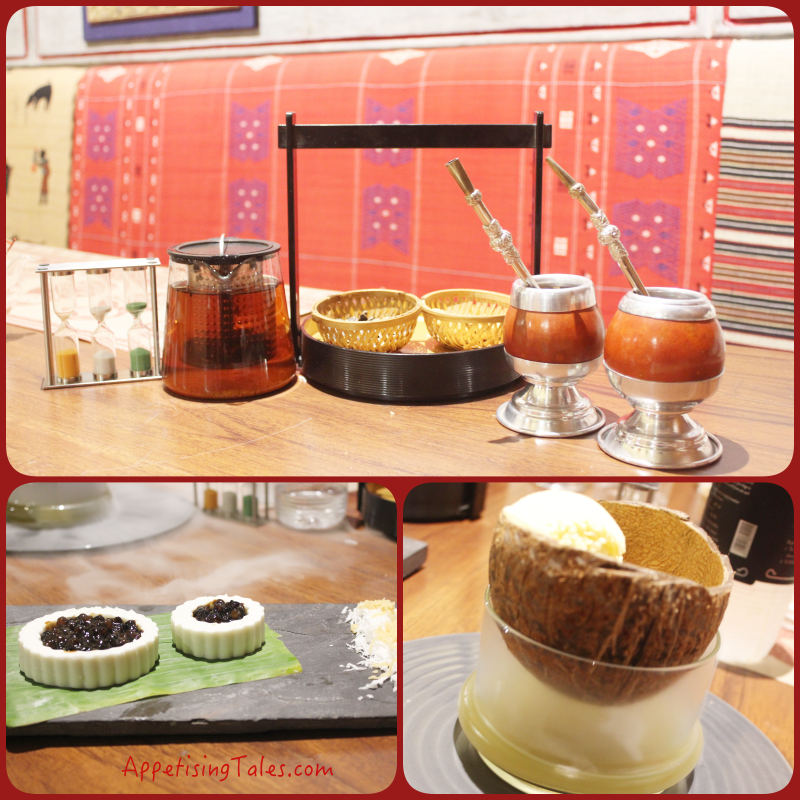 My meal at Burma Burma offers a delectable insight into the fascinating cuisine of Myanmar. “Burmese cuisine offers a mix of flavours from Thailand, China, Bengal, North Eastern states of India and Sri Lanka,” shares Ankit Gupta, owner-partner, Burma Burma. Having worked with the Taj Mahal Hotel Mumbai, he comes with a background in hospitality. Ankit’s mother (Urmila Gupta) lived in Myanmar for almost 25 years, and his aunt (Sumitra Modi) is a renowned caterer in Mumbai, specialising in Burmese cuisine. Their recipes formed a reliable base for Ankit and Chirag Chhajer to open Burma Burma in Mumbai in 2014, that garnered rave reviews and a regular clientele of expats, locals and tourists alike. But prior to that they made countless trips to Myanmar to research further and even pick up artefacts to do up the restaurant. It is thus a pleasure talking to Ankit and hearing him rattle off not only the local names of dishes and ingredients, but also the techniques used in cooking, street food specialties and the time of day when some dishes are relished more than others, almost giving a verbal peek into the native lifestyle of the people of Myanmar. However, the one point on which these young entrepreneurs stopped short was incorporating meats into their food. Ankit hailing from a Marwari background, and Chirag from a Jain family, both wanted to stick to vegetarian fare. So not only are the meats missing, but so are ingredients like fish sauce and shrimp paste. This made their research into authentic recipes all the more important, to filter out and use only the ones that didn’t require the said ingredients. 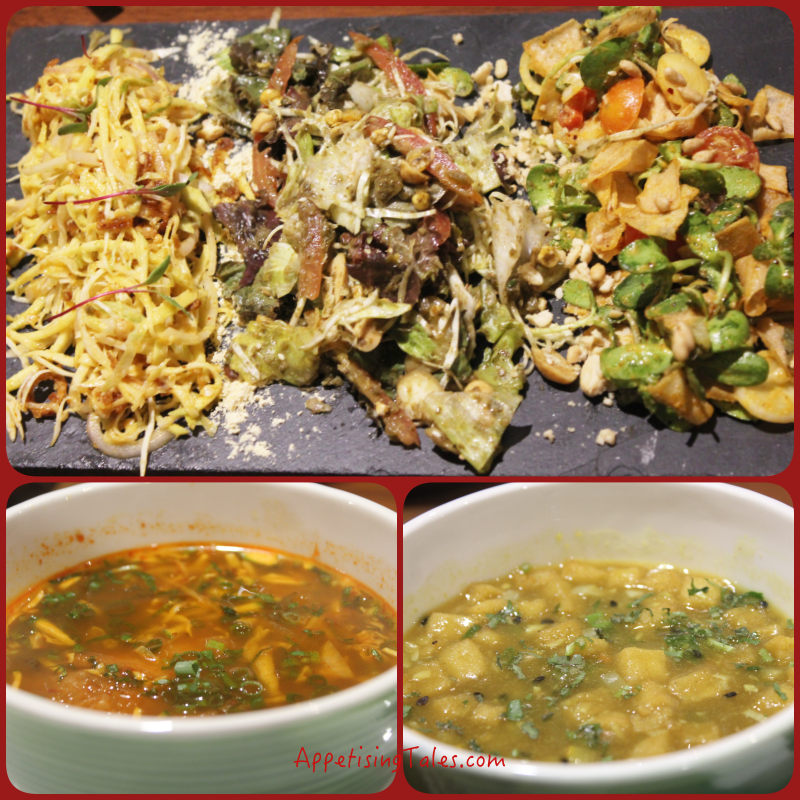 And what they discovered was a huge array of vegetarian dishes ranging from salads and soups to khow suey and rice dishes. The menu at Burma Burma will leave you spoilt for choice and one meal here is certainly not enough to sample the wonderful dishes offering complex flavours and textures that’ll leave you asking for more. We start with a couple of mocktails, Spiced Ginger and Oh No Tamarind. That’s the other thing, Burma Burma does not serve any alcohol. They instead offer a range of non-alcoholic beverages served by the glass as well as pitchers, and an extensive choice of teas. You will find teas from all over the world, served in appropriate ‘apparatus’. “We take our teas seriously,” shares Ankit adding that the right way of serving them is as important as brewing them perfectly. And if you happen to take fancy to any particular type, you can even buy the serving ware at this restaurant and teahouse. While Spiced Ginger is served in a salt-rimmed glass and is a concoction of ginger, green chillies, lime, mint and fizz, Oh No Tamarind offers an unusual mix of tamarind pulp and Burmese jaggery and garnished with coconut shavings. These are accompanied with sunflower seeds, the Myanmar snack that is popular with everybody on the street as well as in fancy restaurants. Then come the ‘hincho’ or the soups. Samuza Hincho (Rs 220) has a samosa dunked in tangy soup with cabbage, carrot and capsicum. 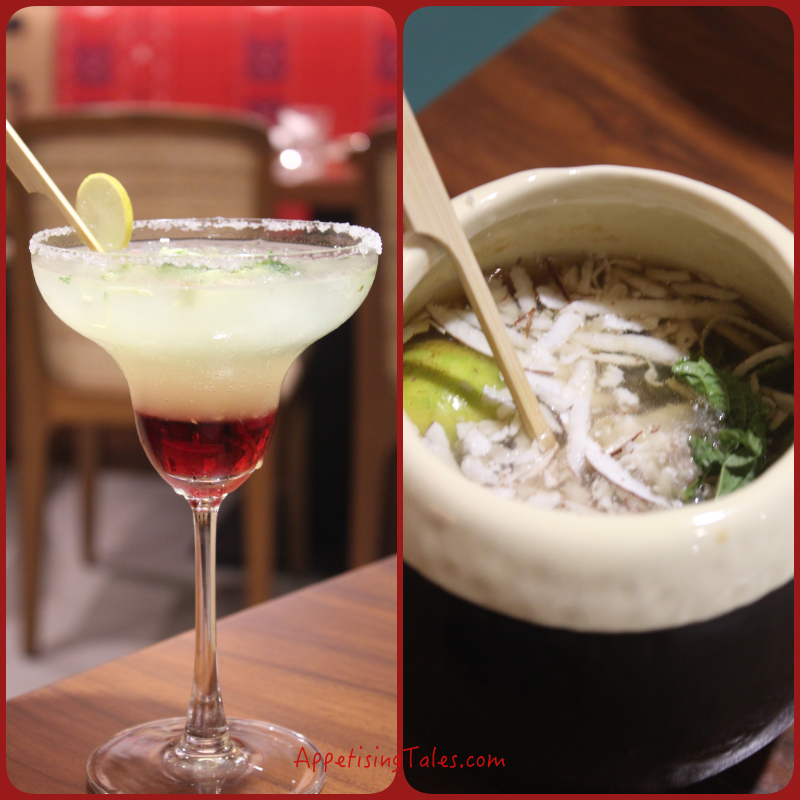 Offering a multitude of flavours, the samosa is quite the highlight of this soup. Tohu Hincho (Rs 220) is the Burmese beancurd soup. It is nutritious and offers a liberal helping of bite sized homemade tofu, garnished with black sesame and coriander. This one lacks the zest of the former, but I quite like the tofu. From samosa to raw mango and pickled ginger to potato salad the choice of salads is impressive. We go for the Thoke Sampler (Rs 480) offering three thoke or salads. Mandalay Laphet is the famous tea leaf salad, Naykar Gyun Akyaw features sunflower leaves and crispy wheat flakes, and the no fuss Tayat ti Thoke or the raw mango salad with roasted red chilly, crushed peanuts and brown onion. 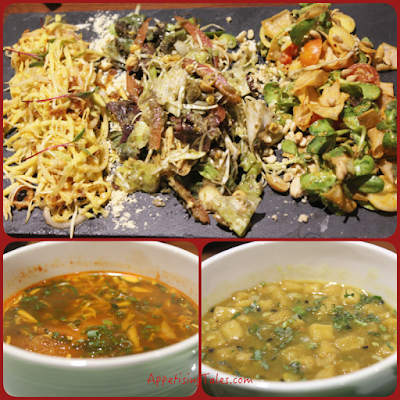 I have to say that all the salads are fantastic, each with many components, and offer completely different flavours. I do recommend you to try the sampler to enjoy the salads. My favourite is the sunflower leaves and wheat flakes for the varying textures that it has. And while I look for tea leaves amidst the other greens in Mandalay Laphet I am informed that fermented tea leaves are used in the dressing. From the starters we are served Alhoor Kyaw (Rs 340) which is scooped potato filled with crushed brown onion, peanuts and roasted chilly topped with sour coconut cream. This dish is rather underwhelming, and doesn’t do justice to its price as well so if you like you could opt for chilly tangy chickpea tohu, barbecue vegetables or Burmese falafel from the extensive choice of starters. Paukse is a popular streetfood in Myanmar. It is a steamed bun that is stuffed with a variety of fillings. We try the Brown Onion and Roasted Chilly Paukse (Rs 300) and love it. 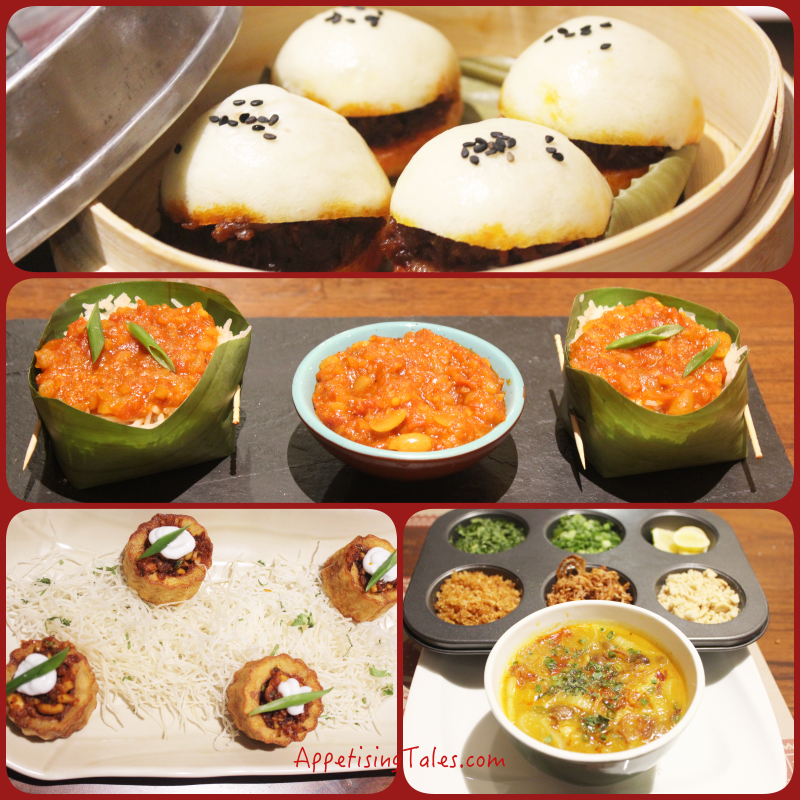 The masala complements that sweet bao-type bun beautifully. This is real comfort food, and the other fillings sound equally appetising – mushrooms; spring onion and garlic; tofu and spinach; and Burmese salsa. “Khow suey means noodles and is essentially a community dish that is typically had for breakfast,” says Ankit. Since the recipe changes from community to community, here you will find six types of Khow Suey on offer. We try the Mohingar (Rs 330) that is the national dish of Burma. It has thin rice noodles dipped in soup made from banana stem, ginger and lemongrass, and is served with condiments including onion crisps, fried garlic, spring onions, peanuts and lemon juice. I won’t say that this is the best khowsuey I’ve had, owing to the unaccustomed flavours of the broth, but it is worth tasting. Next time I would stick to their signature Oh No Khow Suey or try the Dry Khow Suey and even China Town Noodles. Apart from this there is a range of rice dishes, curries and stirfries. Portions are well priced so you would do well to go with a bunch of people to try as many different dishes as you can. Ohn Thamin (Rs 340) is rice cooked in coconut milk and topped with peanut and tomato chutney. Again, a delicious comforting dish. 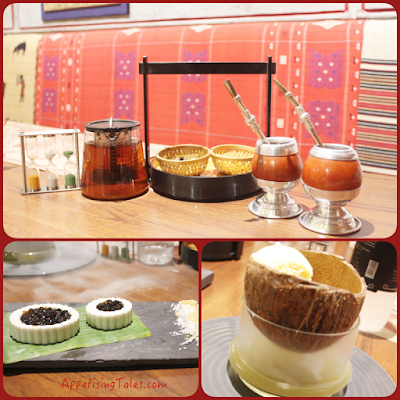 Although the desserts have a selection of international favourites including cheesecake, chocolate caramel dome as well as chocolate mousse, we have the Burmese specialty – Tagu Pyian (Rs 240) that is sago cooked with Burmese palm jaggery, served with coconut custard. This beautifully plated sweet is an acquired taste for sure, but if you have a slightly adventurous palate do give it a try. The sago is cooked in jaggery till it becomes dark brown, lending it a wonderful caramelised flavour. I am also happy to find Durian Icecream (Rs 270), the famous fruit that ‘tastes like heaven but smells like hell’. Here it is served over wafts of lemongrass fumes that take care of the smell, leaving you with a heavenly icecream. 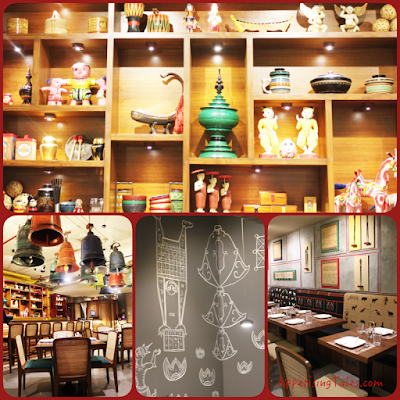 The decor features an interesting collection of Burmese artefacts. We round up our meal with some South American tea with a hint of sweet mango, served beautifully, along with some more sunflower seeds. The décor, that has mainly been done in-house, features Burmese artefacts like tattoo needles, little Buddha statues, wickerware and papier mache. Large colorful bells form the centrepiece on the ceiling, and most of the upholstery is made using Burmese handwoven sheets. Step into Burma Burma to get a sensory experience of Myanmar. Come with an open mind to experiment with some unfamiliar flavours and some familiar ones presented with refreshingly new twists. Burma Burma, Building 8, Tower C, DLF CyberHub Gurgaon. Timings: Lunch 1pm; Dinner (two time slots) 8pm; 9-45pm.